Church Street served as the focal point for a look at Wytheville's historic district. Dan and Judy Challgren, owners of the beautiful old home known as the McGavock House in "The Walking Tour Guide of Wytheville," graciously allowed their home to serve as the background for a surprise "appearance" of Abigail Jouet Williamson McGavock, the wife of the merchant Ephraim McGavock. English visitors that some of the funds raised for the establishment of the church came from England. The Pines at 450 Church Street, the home of Frisby and Adelaide Smith, provided an appropriate setting for a conversation relating to the time and topics suggested by the real estate catalogues of 1872. An emigrant from Ireland, Peter Gallagher, whose family had settled in Wytheville, built in 1872 the Georgian-style brick house now known as The Pines. His family appeared to be typical for that time. Seated with the English visitors in the Victorian living room, in what was probably the Gallagher parlor, Frisby and Adelaide shared the story of Gallagher, namely his role as a Confederate soldier, his appointment as sheriff of Wythe County, his venture in the mining of iron ore. and his decision to move west after the death of his wife. While on the Church Street tour, Gary Davenport of the Wytheville Police Department joined the group. Inspector Davenport, a native of London, England, the Reeds and the Palmers were delighted to share stories of their various London experiences. The tour continued with a trip toward the east end of Wythe County via Interstates 81 and 77. Along the way the group commented about the communities of Fort Chiswell, the Fincastle Resolutions, the lead mines, the various iron furnaces, the area where Stephen Austin lived, and other points of interest. The tirst stop was at the Jennings Farms on New River formerly known as the Sanders Farm. 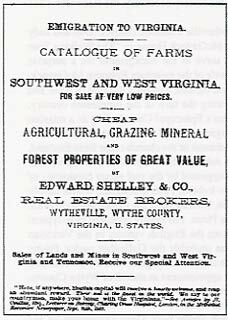 The visitors saw first hand that the rich farm lands and fine cattle were still in existence and that the appearance of this farm was similar to the land descriptions found in the real estate catalogues of 1872. The last stop was at the Jackson Ferry Shot Tower. The Reeds and Palmers were very much interested in this site because of their familiarity with the shot towers in England. They even described one that had been incorporated into a shopping mall. At this point an unexpected event happened which provided additional time for conversation. As Ken Baker turned the key in the ignition of the bus, nothing happened. The battery was dead. but Rosa Jude came to the rescue with her cell phone. She called the Jennings farm, and Edd Jennings appeared in a relatively short time with a jumper cable. Soon the group was on the way back to Wytheville. Before meeting at The Log House 1776 Restaurant at four for an early dinner with host Mayor Trent Crewe, the English foursome visited the Heritage Preservation Center and Gift Shop. The Log House provided a relaxed atmospnere for a dinner that all enjoyed. The conversation varied with topics that ranged from travel to politics, from favorite foods to gardening, and from history to current events. David and Ann Palmer declared that the day had been great and they felt as if they had been treated like royalty. Alan and Alison Reed stated over and over that they were delighted their decision to celebrate Alan's birthday had been successful and that the town ofWytheville had shown such enthusiasm for Alan's gift from the law firm of Bennetts. The meeting of the Wytheville Town Council began that evening at 7 p.m. Alan Reed was the first speaker on the agenda. He stepped forward with the documents tied with a red, white, and blue ribbon and a bouquet of flowers in patriotic colors. With eloquence and poise he announced, "I come bearing gifts from England." 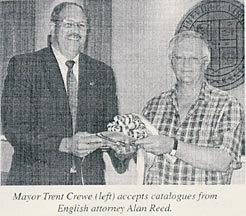 Mayor Crewe, accepting the faded but well-preserved catalogues on behalf of the town of Wytheville, expressed the appreciation of the citizens and stated that the documents would be treated with great care. 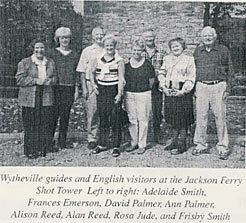 Following an interview with Frances Emerson on the day after the visit, Stephanie Porter-Nichols reported in the October 16, 2003 issue of the Wytheville Enterprise that Emerson hopes to stay in touch with the Reeds and Pahners and keep them informed about the result of the research derived from the catalogues. The catalogues along with resulting information from further study may one day serve in a museum exhibit. Alan Reed's discovery has made a significant impact on the local community. A definite connection between Wytheville, Virginia and Wrington, England has been established, friendships between the English visitors and several Wytheville residents have been made, and interest in the history relating to the contents of the catalogues has been aroused. The saga of Reed's discovery has begun!